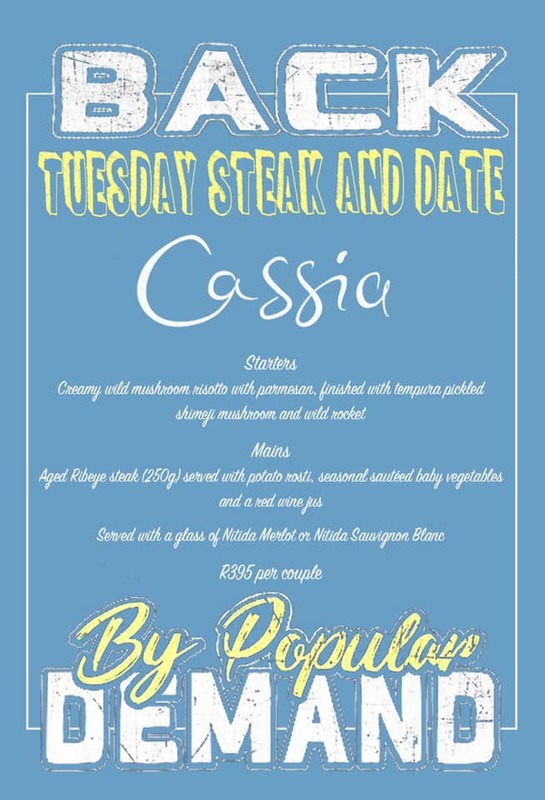 TUESDAY STEAK & DATE NIGHT AT CASSIA! Back by popular demand, we have created a special Tuesdays Steak & Date night menu that will fill your Tuesday evening and your belly with starters and mains at R395 per couple. Please don’t forget that bookings are essential and that should you have any dietary requirements, you can discuss them when you contact us. For starters, enjoy a creamy wild mushroom risotto with parmesan, finished with tempura pickled shimeji mushroom and wild rocket. And for mains, indulge in Aged Ribeye steak (250g) served with potato rosti, seasonal sautéed baby vegetables and a red wine jus. As the cherry on top, you can choose between a chilled glass of Nitida Sauvignon Blanc or a joyous dark, red plum glass of Nitida Merlot.